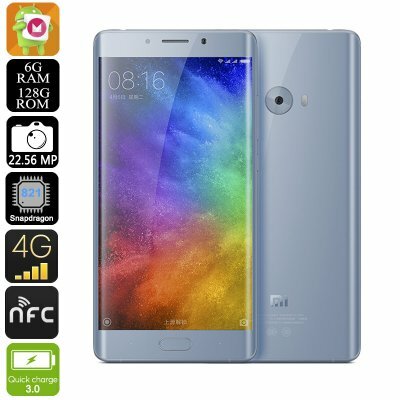 Successfully Added Preorder Xiaomi Mi Note 2 Smartphone - Android 6.0, Snapdragon 821 CPU, 5.7 Inch Display, 6GB RAM, 4G, NFC, 22.56MP Cam (Silver) to your Shopping Cart. The Xiaomi Mi Note 2 is yet another amazing flagship device that is soon to be launched by one of China’s largest and most influential smartphone manufacturers. With its beautiful and sleek design this extremely thin smartphone features a massive 5.7 inch display that wraps around the sides of the phone, providing you with an ultra-wide view to enjoy all your media to the absolute max. Supporting a 1080p display resolution you can be assured that, no matter the purpose you use this Chinese smartphone for; you will always be treated with an astonishing visual experience. Running on the MIUI 8 operating system that has been based on Android 6.0, the Xiaomi Mi Note 2 lets you enjoy all the latest industry features Android users are used too along with its own optimization features. An extremely smooth and fast user experience is guaranteed with the phone’s Qualcomm Snapdragon 821 CPU that has been clocked at a stunning 2.35GHz. This Quad-Core CPU is one of the most cutting-edge mobile processors ever created, designed to support superior connectivity, graphics, power, and battery efficiency to guarantee an unbelievably smooth user experience. Along with its 6GB of RAM this extremely powerful Android phone can effortlessly handle anything you throw at it, no matter how demanding. With its massive 4070mAh battery and Quick-Charge 3.0 technology this phone lets you enjoy countless hours of continuous usage time, allowing you to get through the most demanding of days and taking away the need to ever worry again about running out of juice. Coming with a massive storage of 128GB the Xiaomi Mi Note 2 offers plenty of space for all your files and media. So head out to the Play Store and download all your favorite games and movies, or snap unlimited pictures with your phone’s camera – with this Android phone you can be assured you won’t run out of storage space anytime soon. Packing an unbelievably high-end 22.56MP rear camera the Xiaomi Mi Note 2 lets you snap pictures of breathtaking quality. Mobile photography will be taken to entirely new heights with this professional-grade camera as from now on you’ll be able to catch mesmerizing images no matter where you are. Additionally, this state-of-the-art camera is capable of shooting 4K video – allowing you to capture and share all those unforgettable moments in life in ultra-high resolution. Thanks to its 4G connectivity and Dual-Band Wi-Fi you will now be able to share all your pictures and video’s in the blink of an eye.